Floating cities have been designed for more than 50 years, but have not yet been built, due in part to engineering stability issues of keeping them anchored in place and protecting them from waves. Biorock Technology provides crucial enabling technology for floating cities with cost-effective solutions to the fundamental problems of anchoring and protecting them from waves, while simultaneously feeding them and regenerating marine ecosystems and fisheries. Biorock is a unique ocean technology that produces the only marine construction material that grows, becomes stronger with age, grows back if damaged, and regenerates marine ecosystems and severely eroded beaches at record rates. Biorock applies safe extremely low voltage (SELV) direct current trickle charge to steel structures of any size or shape. This completely prevents any rusting or corrosion, and grows solid limestone rock (the rock of coral reefs and pyramids) in seawater that is two to three times stronger than ordinary concrete, and if damaged, heals itself. Biorock reefs grown in front of severely eroded beaches regenerate beach sand in months. Biorock shore protection reefs cost a fraction of conventional concrete and rock seawalls and breakwaters (which cause sand erosion). Biorock reefs have survived the strongest hurricanes. Biorock rapidly regenerates coral reefs, oysters, sea grasses, salt marshes, mangroves, fisheries, and coastal ecosystems where there is no natural recovery. Biorock greatly increases settlement, growth, survival, and resistance to extreme high temperatures and pollution stress for corals and all marine organisms. Biorock coral reefs survive severe bleaching events, and rapidly regenerate reefs and fisheries. 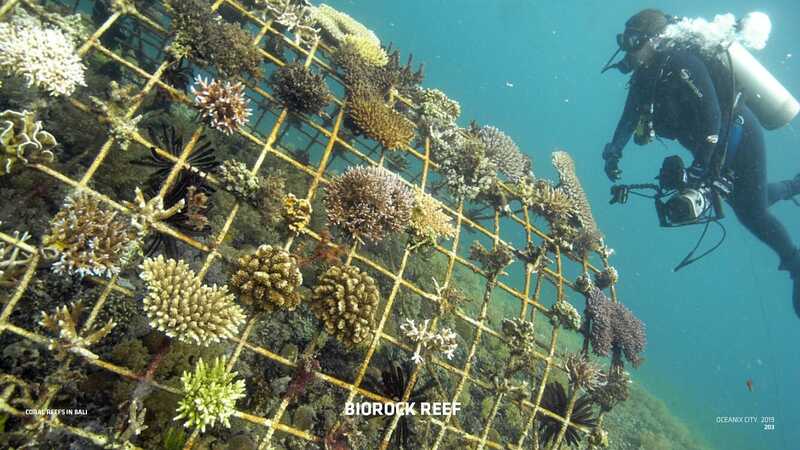 Floating Biorock reefs filter and clean polluted coastal waters. Biorock reefs growing on the bottom provide strong growing anchoring points for mooring the floating cities, while also regenerating sea floor ecosystems, without scouring of bottom sediment. A one-year old Biorock reef in Indonesia. Biorock reefs get heavier with age, attach themselves to the sea floor, and attract all forms of marine life. 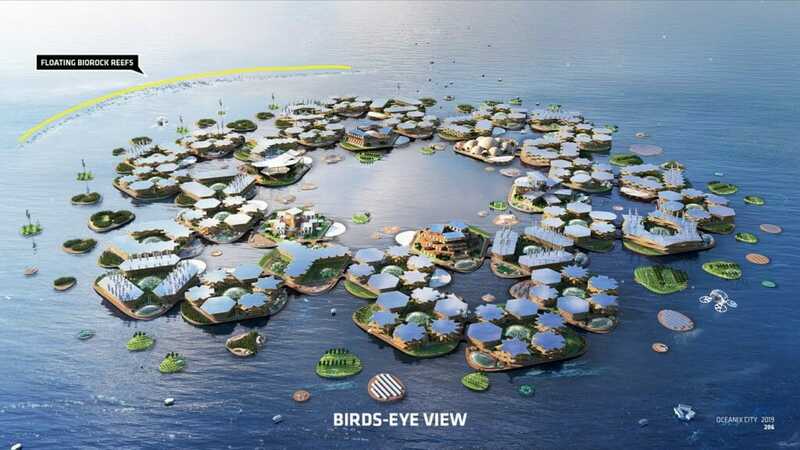 Biorock floating reefs, powered by sun, wind, waves, and ocean currents, dissipate wave energy and protect the floating city, while producing food and regenerating open ocean fisheries. Cities have historically drained food and raw materials from their hinterlands, and exported pollution in return. Every coastal city is surrounded by expanding rings of dead and dying marine ecosystems, overwhelmed by harmful algae blooms over-fertilized by our failure to fully recycle our sewage and agricultural wastes on land. Biorock technology can reverse spreading ocean blight and turn floating cities into centers of sustainable whole-ecosystem mariculture, seeding ecosystem regeneration and biodiversity in surrounding waters. 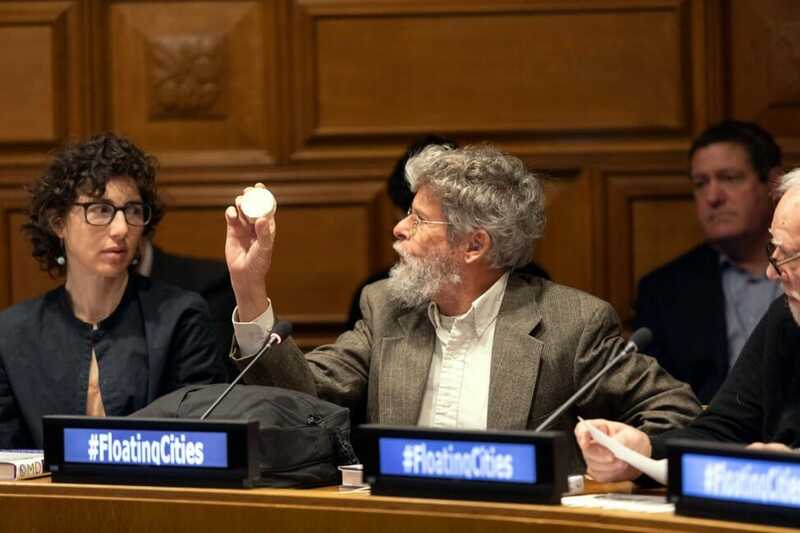 Floating cities are not an idle luxury, they will be essential to save billions of people from becoming climate change refugees in the existential crisis we will face when global warming catches up with increased CO2. The full impacts will be delayed until the deep ocean warms up, in a few thousand years, but it must be understood that when that happens the ultimate long-term steady state temperature rise and sea level increase for the current atmospheric CO2 of 400 ppm is +17 Celsius, and +23 meters above current levels! We have only barely begun to feel the very first impacts of global sea level rise, which will be far worse than, and continue for thousands of years beyond the short-term projections made by IPCCC. It would be wise to prepare now for global climate change that will become irreversible if atmospheric CO2 is not urgently reduced to pre-industrial levels. This piece of Biorock, cut from a reef grown two years in the Maldives, is 2-3 times harder than concrete. It was grown over a steel bar, seen rust-free in the center. 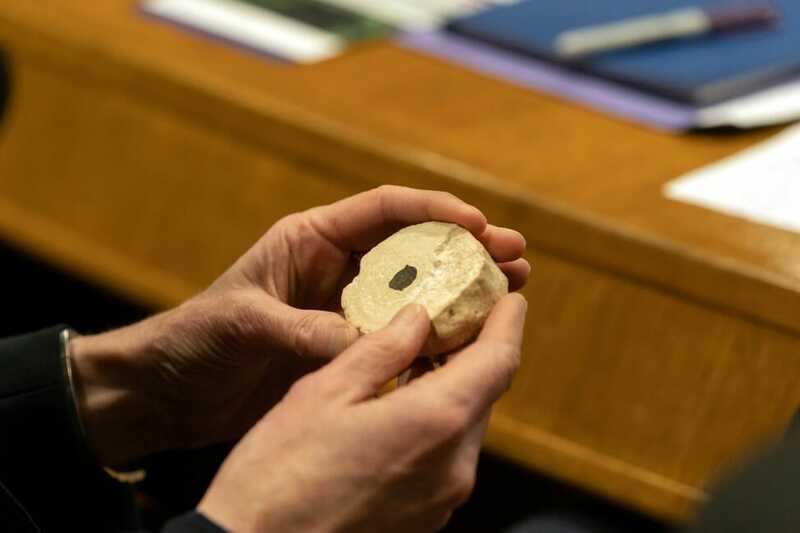 Biorock sample shown at the United Nations Roundtable on Sustainable Floating Cities. More than 100 countries hope to develop “Blue Economies”, based on sustainable use of marine resources. This will not be possible unless we regenerate our dying ocean ecosystems. Biorock, a regenerative ocean technology, provides the most cost-effective tool to do so, and to produce building materials in the sea for sustainable floating cities and the future Blue Economy. GCRA thanks Oceanix and UN Habitat for the invitation to participate.